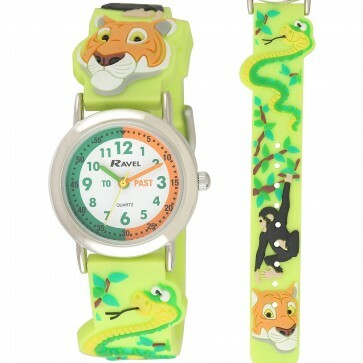 The Ravel Rascal Time Teacher watch range is the perfect watch to help teach children to tell the time with. Made using a soft silicon strap with high quality 3D childrens designs and a colour co-ordinated time teacher dial this watch will help demonstrate the difference between "to" and "past." It has a numbered minute track with a full 1-12 dial and coloured hour and minute hands to make learning to tell the time as easy as possible. The R1513.78 comes in this fantastic cartoon jungle design. All Ravel Kids Time Teacher watches are fitted with crown stoppers to protect battery life and are packed in a clear Ravel hanging pouch with guarantee card.